Engraved title-page with woman on column holding cross and book wearing robe with Society of Jesus emblem on front. Telles, Balthazar, Simão Rodrigues, Lucas Emil Vorsterman, and Paulo Craesbeeck. 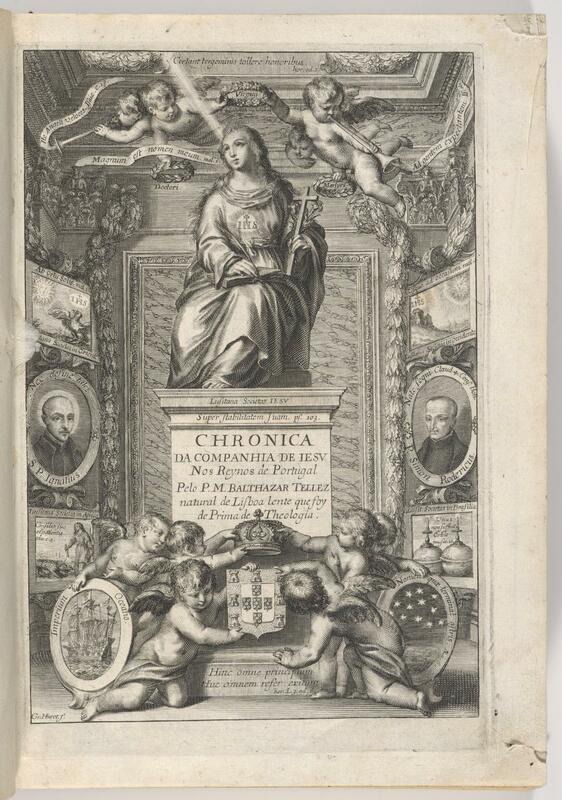 Chronica Da Companhia De Jesu Na Provincia De Portugal : E Do Que Fizeram, Nas Conquistas D'este Reyno, Os Religiosos, Que Na Mesma Provincia Entràram, Nos Annos Em Que Viveo S. Ignacio De Loyola, Nosso Fundador. 2 vols. Lisboa: Paulo Craesbeeck, 1645.